In the native Iroquoian language, Ontario means 'beautiful water', a description that certainly fits the bill when it comes to describing this Eastern Canadian province. Ontario has some great national parks and beautiful scenery - it is also rather notable when it comes to culture. 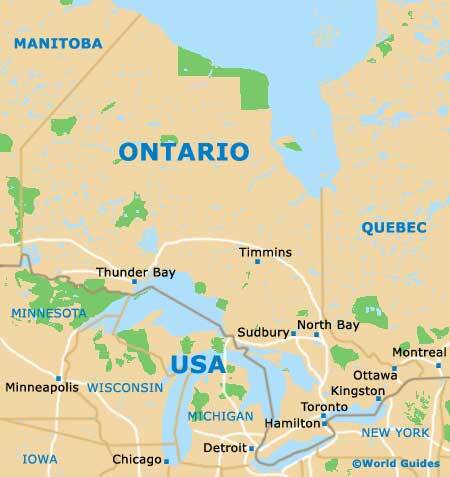 Ontario is handily divided into two distinct regions, making it remarkably easy to get your head around a map of the province. Northern Ontario is split between lake-studded forests and the swampy Hudson Bay Lowlands. It is a place that prides itself on having 'weather' rather than a 'climate'. Snowstorms are deep, and thunderstorms are of window frame-rattling proportions. Sunset Country offers some of the finest freshwater fishing. Rainbow Country is dotted with around 30,000 islands and is a paradise for sailors. Northern Ontario's Wilderness Region stretches for mile upon mile of untamed and starkly beautiful land. Southern Ontario is a very different place. It might be smaller than its northern neighbor, but most of the province's cities are here, along with a whopping 92% of Ontarians. Visitors come here in their millions - many of them arriving via the nearby US land border, drawn by such magnets as the spectacular, if rather overcrowded, Niagara Falls, as well as the Great Lakes and Canada's Wonderland, the largest theme park in the country. This region is also a sportsman's paradise, with plenty of hiking, skiing and kayaking opportunities for the taking. Canada's largest city, Toronto, balances artfully between being very much Canadian and yet having its sights firmly on the US New York State, just across the waters of Lake Ontario. Toronto sells itself as a haven of multiculturalism that's also a great place to shop, eat out and generally have fun. For most tourists, though, it is about taking a trip to the top of the spindly CN Tower, which is Canada's equivalent of the Eiffel Tower. Head to the top when the weather is clear and the views are at their best. One of the world's most famous natural wonders, the Niagara Falls attracts around five million tourists every year. Nearby, the city of Niagara Falls has been greatly developed with tourism in mind and features many top museums. One of Ontario's most charming and attractive tourist destinations, the town of Niagara on the Lake lies just a matter of minutes downstream from the world-famous Niagara Falls and is located on the scenic shore of Lake Ontario. The city of Ottawa is situated in Ontario, at the meeting point of the Rideau, Gatineau and Ottawa rivers. Surrounded by a greenbelt, Ottawa offers an array of cultural activities and an extensive calendar of superb festivals. The largest city in Canada, Toronto is home to the world's tallest free-standing structure, the CN Tower, which towers over many other stylish buildings nearby. Toronto is a vast city and is often simply known as the 'Megacity'.